YEREVAN—On the morning of Dec. 11, Armenian Revolutionary Federation (ARF) members and supporters from around the world convened at Yerevan’s Yerablur military cemetery to celebrate the organization’s 125th anniversary. Those present included members of the ARF Bureau and ARF Armenia Supreme Body, representatives from ARF regions in more than 30 countries, as well as heroes of the Artsakh Liberation and members of the ARF Youth (Armenian Youth Federation of Armenia, or AYF) and student organizations. The event began with a symbolic flash mob dedicated to the 125th anniversary, with the participation of 125 members of AYF Armenia. Participants then paid a moment of silence for the memory of fallen members and soldiers who were killed during the Artsakh War, at the Tomb of the Unknown Soldier. A special swearing-in ceremony was held, during which several new members were welcomed to the party. 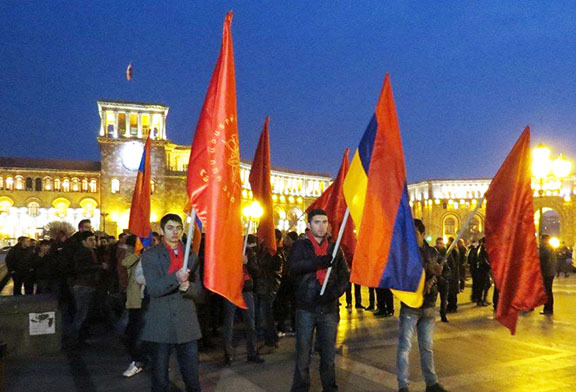 The event began with a symbolic flash mob dedicated to the 125th anniversary of the ARF, with the participation of 125 members of AYF Armenia. 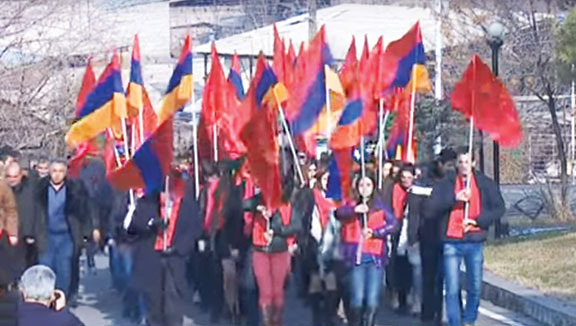 Members and supporters later held a procession march on the streets of Yerevan, before the official celebration of the party’s 125th anniversary at the State Opera and Ballet building. 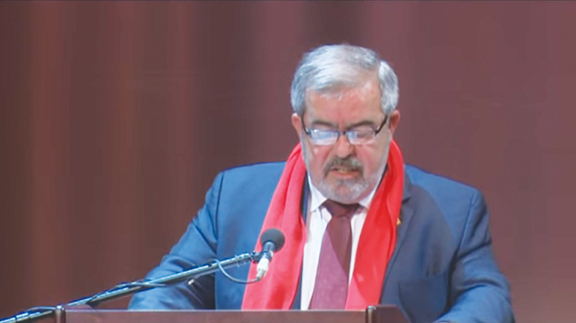 During the official celebration, which was attended by high-level dignitaries, government officials, and ARF members and supporters from around the world, ARF Bureau Chaiman Hrant Markarian spoke about the history of the party and its significance today in Armenia and around the Armenian Diaspora. “The ARF would not have been established if it was easy to have a homeland and to be Armenian… The ARF was not an ordinary political party that emerged during the liberation struggle. Rather, it was the culmination of the national will of the Armenian people,” said Markarian. He then detailed the extensive work of the party around the world. “Throughout its existence, the ARF has been there, where Armenians were in danger. Today, we stand beside the Syrian Armenians and we have managed to create a climate of unity in Syria, thanks to our efforts and the efforts of Armenians all over the world,” he said. Also speaking at the event, ARF parliamentary faction secretary Aghvan Vardanyan noted the important work of the founders of the party and the first generation of ARF members. “The work of our predecessors was difficult—unspeakably difficult. Living in between two empires, they not only founded a strong political movement, but also established an independent republic,” he said, adding that the current generation has much to do to live up to what the party has stood for. Vardanyan also spoke about the role the ARF has played in organizing communities and the important political work members have done over the years, as well as the work they have yet to do. “With many difficulties, our predecessors organized Armenian communities in the daspora, helped preserve the Armenian identity, and put the Armenian Cause on the political agendas of countries around the world. They were able to do this because of their hard work, determination, and steadfast belief in the Armenian nation,” he said. Armenian President Serzh Sarkisian’s congratulatory message to the members of the ARF was also read at the event. “From the moment of its conception, the party has been a leading force in the Armenian political life, always in the vanguard of the liberation struggle of the Armenian people, striving within its capabilities to promote our just cause,” read a part of his message. Sarkissian also commended the ARF’s efforts in preserving the Armenian identity in the diaspora, and its work in Armenia. A day earlier, a two-day academic conference held at the National Academy of Armenia entitled, “The Armenian Revolutionary Federation and Armenian Statehood,” concluded. During the conference, participants presented more than 20 academic papers on the role and historic significance of the party.